Sunny Kitchen prepares and serves organic and sustainable delicious meals and snacks. 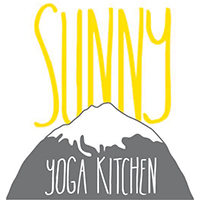 Sunny Yoga Kitchen is a multi-functional space housing a full Yoga Studio and Petite Kitchen and Cafe with indoor and outdoor seating. The Eats and Drinks coming out of the Sunny Kitchen are inspired by a lifelong passion of ours; to eat, cook and serve organic, sustainable and delicious meals and snacks. We buy lots of our fruits and vegetables from Agricultural Connections here in Bend. In our kitchen we focus on seasoning, freshness, and preparation. Our cooks are efficient and passionate about bringing you our favorite dishes and beverages, everything we truly enjoy.